Zulfahmi, former director of Riau NGO forest network Jikalahari, is a member of Sawit Watch and has attended several meetings of the Roundtable on Sustainable Palm Oil (RSPO), including the latest (RT4) in Singapore, last November. This year's forest fires and resulting smoke-smog pollution have again caused havoc over large areas of Kalimantan and Sumatra. Dry conditions meant that the fires spread rapidly and continued into November, before rains started easing the situation. The choking 'haze', which is expected to take a heavy toll on local people's health, spread to neighbouring countries, prompting President Susilo Bambang Yudhoyono to apologise to them. Will legal action help save forests and livelihoods in the Mentawai Islands? The following is adapted from an Indonesian language report by WALHI West Sumatra and interviews with Yayasan Citra Mandiri, an NGO which focuses on Mentawai issues. The Mentawai Islands, off Sumatra's western coast, are renowned for the unique culture of their indigenous communities and the rare species that have evolved in this isolated rainforest archipelago. Afnawi Noeh, popularly known as Abah Nawi, leader of the indigenous community organisation BPRPI, died in February 2006 aged 69. He and his family had been fighting for land rights recognition for peasant farmers in North Sumatra for over 50 years. Abah was a leading member in Indonesia's indigenous movement, attending AMAN's inaugural conference in 1999 and becoming a Council member. BPRPI currently acts as AMAN's secretariat in North Sumatra. Looking over the vast expanse of mudflats that stretched to the horizon, I asked where the village had been. The man pointed towards the sea. Apart from the few ragged remaining coconut palms, it was indistinguishable from the land which had been paddy fields and shrimp ponds. One year on from the December 26th quake-tsunami disaster and the scale of the reconstruction work needed is all too apparent. Aceh's forests are being stripped in the name of post-tsunami reconstruction. In reality, the timber becomes part of lucrative international timber smuggling. 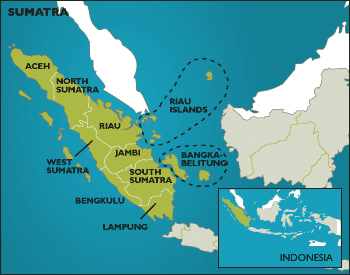 The products of illegal logging from South-east Aceh are transported to Sibolga on the west coast of North Sumatra, and from South Aceh to ports near Medan in North Sumatra. From there, they are exported to Malaysia and further afield. Questions are being raised over a World Bank-funded land titling project in post-tsunami Aceh. Securing land tenure has become one of the priorities in the reconstruction of Aceh, post-tsunami. More than half a million affected people have had to endure changes to the landscape and have been left without evidence of their property rights. According to the national land agency, BPN, approximately 300,000 land parcels have been affected by the tsunami.